Donguibogam Village, Sancheong-gun, Wednesday 11 September, 4pm. In Korean mythology, it seems that it’s not the bear that has the sore head. It’s the tiger. 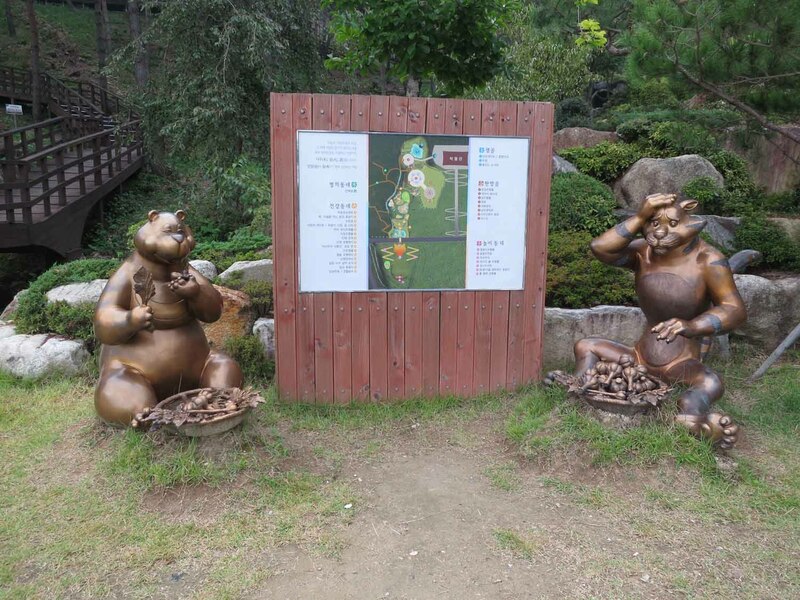 In the Korean Medicine Theme Park, which forms part of the Donguibogam Village, the exhibits focus on the different parts of the human body, but throughout there is the recurring motif of Tiger and Bear. The whole park is sandwiched between a giant bear’s head at the top and an equally large tiger’s head at the bottom. In between we see a tiger-bear couple in different scenarios, some of them humorously domestic. The view from inside the bear’s mouth in the Korean Medicine Theme Park in Sancheong. The back of the tiger’s head is just visible through the pillars, as is the part of the Theme Park devoted to the rib cage. Tiger and bear in a more natural setting, in the part of the Korean Medicine Theme Park devoted to the foot. The back of the giant tiger’s head can be seen top right. 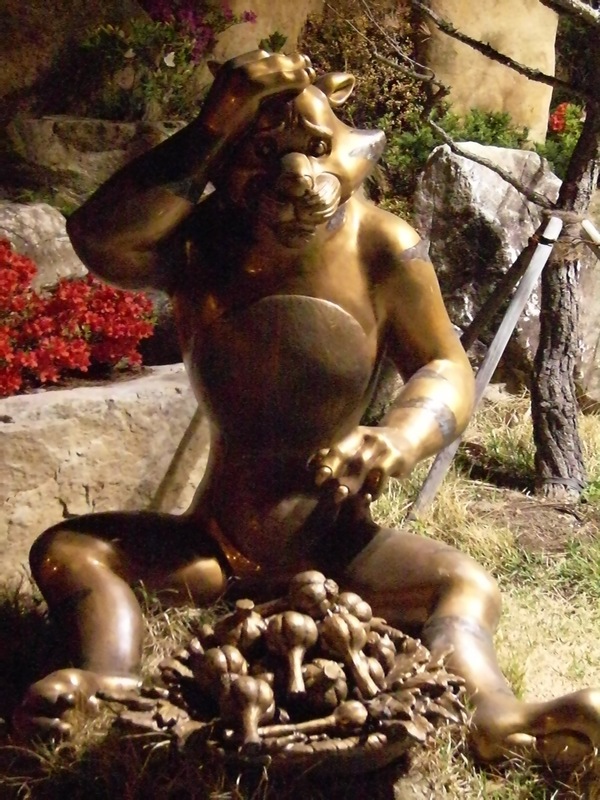 The story of the Tiger and the Bear is embedded in Korea’s foundation myth. The legend is told in the Samguk Yusa. Hwanin, the Lord of Heaven is said to have granted the wish of Hwanung, his younger son, wish to go down to Earth, and so opened the heavens for him to allow him to descend to Korea, where he settled on Mount Taebaek. A tiger and a bear had tired of their animal existence, and asked Hwanung to turn them into humans. The instructions were simple: retire to a cave for a hundred days and eat nothing but garlic and mugwort. The tiger found the diet not to his liking, and soon gave up on the exercise. But the bear persevered to the end, and emerged from the cave as a woman. She later bore to Hwanung a son, the father of the Korean people, Tangun. Many Koreans read into this foundation myth the civilising influence of a sensible diet – and in particular a diet which contains medicinal herbs. Garlic has anti-bacterial properties, can benefit the heart and prevent colds, while mugwort has a range of uses: it is said to have an affinity for the female reproductive system: it can act as a uterine stimulant that can bring on delayed menstruation. It can also stimulate the digestion, and when used in herbal pillows can bring on lucid dreams. It is also commonly used in Korean moxibustion. While the herbal medicine diet agreed with the bear, it seemed to have given the tiger a severe headache, judging by one of the statues on the way down the hill. As I reach my rendezvous with Sena, near where the Expo’s opening ceremony had been held, I see that not only Sena is there, but also Sena’s mother, an official driver, and Mr Min Hyang-sik, my long-standing Sancheong County guide. This is a pleasant surprise. The first stop on our sight-seeing tour is a mock-up of a traditional doctor’s practicing room: a hanok-style house whose room was open to the elements to facilitate viewing. In the garden, various healing roots and herbs were laid out on display, and in a quirky reference to Sancheong as the birthplace of cotton in Korea, cotton plants were the main decoration in the borders. It is somehow comforting that stress has been endemic in Korea for more than 400 years, and that when a modern Korean tells you how stressed he is, their distant ancestors will have had exactly the same feelings. The stressometer involved plugging your finger into something that looked like a fingerprint reader. I knew that if I’d had my stress levels checked a week ago I’d have been off the scale, but today I knew I’d be much more normal. I decline the check, and walk through a darkened corridor filled with aromatic herbs designed to reduce the stress levels. And it was after emerging from this tunnel, which featured in the section relating to chapter 3 of the Donguibogam, the one relating to the various ailments including stress, that you could experience the pillow of eternal youth, of which more later. Be honest: what would YOU answer? Through a brief question and answer session on a computer screen I determined which body type I was, and was gratified to learn that I was a Ta-eum-in: “This type of person is smart, and has dignity. This type is often found in businessmen or scholars.” And “This type of person is likely to be steady and calm. This type tends to have a strong capacity to make achievements”. This was certainly a more comforting diagnosis than the one I was to receive at the Healing Village the next day. You could insert your hands or feet into machines which looked like giant rice cookers. It was difficult to determine whether one machine gave you a foot massage or a foot sauna, but it was certainly popular with the visitors. A more comfortable foot massage treatment was offered in the special Cypress Experience area, where you were invited to walk on a path of hinoki cypress cones and shavings. This was particularly pleasurable for someone whose feet had been constantly itching from the mosquito bites incurred while at prayer in the temple the evening before. The woody, slightly spirited fragrance of the tree’s oils filled the room and gave a feeling of calm. And while on the subject of calm, back to the pillow of eternal youth: a pillow made of hinoki cypress wood and filled with a secret melange of herbs. The story of the melange, found in the Donguibogam, illustrates the way herbal remedies seem to be entwined in Korea’s history and mythology.